Just a quick note this week. We have had a French exchange student with us since last Wednesday. Things are going well. She’s a very polite and quiet exchange student. The only thing I really don’t get about her is that she has left home without a book. This is a mystery to me. And it presents a bit of a dilemma for the 9th grader, who needs her down time, and would like to spend some of it companionably with our visitor reading. I say exchange student, by the way, but there is no exchange involved, unfortunately. This is because our school district no longer allows our students to stay with host families abroad. Our French teachers argued for it to no avail. Anyway, to entertain the visiting students, some of us got together for a day trip to Woodstock. Woodstock is not actually very near where Woodstock occured, but it is a very groovy town full of vintage clothiers, flea markets, incense, Tibetan flags, Indian prints, and all manner of yoga-related symbols, as well as expensive comfortable clothing and shoes - and good food. It was a win-win. I got into the spirit of things in one of these shops and decided I needed something Ganesh-related. In case you were wondering why, Ganesh is the Hindu god of success or of removing obstacles, which is apparently the same thing. I agree they are related. And Ganesh abounded in this shop. I chose a cool postcard with an image of Ganesh on it and went to buy it, only to be told by the cashier that the side of the shop where I got it was owned by someone else, and since my postcard had no price tag, she couldn’t ring it up on her register. Ganesh was an obstacle in this instance. And that, Readers, is ironic. However, for reasons of who knows what - maybe kindness, perhaps amusement - the husband liked this story and also thought I needed a Ganesh, so he ordered one for me from Amazon. It arrived today. I’m not entirely sure which obstacle I hope Ganesh removes. I hope that’s not a problem. However, it may be problematic, since I’ve learned that setting specific intentions is a potent way to get things rolling in the right direction. A general wish is kind of wishy-washy, if you will. What if Ganesh removes all obstacles? That could be mayhem. Some obstacles should remain in place. For example, red lights and stop signs and some kinds of inhibition. Let’s assume the idea is Ganesh removes obstacles to success. So, what success am I aiming for ? I think we all know it. But while I like my little Ganesh, the more useful method of removing obstacles to success is mental contrasting. Mental contrasting is a method of visualizing yourself achieving a goal, then considering carefully the obstacles to it that you might encounter. Once you identify an obstacle, visualize yourself overcoming it and how you will do it. Then visualize your goal and another obstacle and so on. Thus you merge a positive mindset with the knowledge that you will have to work to achieve it, as well as that you have the ability and grit to do so. Recipe for removing obstacles. 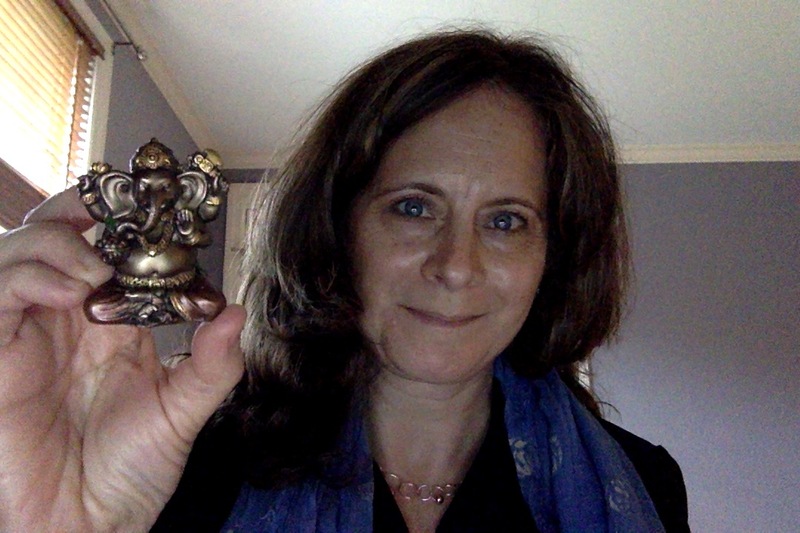 So my little Ganesh will sit by my computer as I write and will remind me that I have the power to remove obstacles to success. And also, perhaps, my little Ganesh will work some magic over the things I cannot control.